Better off Friends by Elizabeth Eulberg – I LOVE THIS ONE. Elizabeth Eulberg is the author of four previous contemporary YA titles, and I’ve had her on my radar since I read Revenge of the Girl With a Great Personality (a super funny and actually sweet YA behind the scenes of children’s beauty pageants and the families of the girls who compete). Eulberg has an ability to tell a great story full of poignant, really valuable moments that also make you laugh out loud. When I saw she had a new book coming out, I knew I had to read it… especially when I saw it compared to When Harry Met Sally! I mean, come on. Who can resist that? 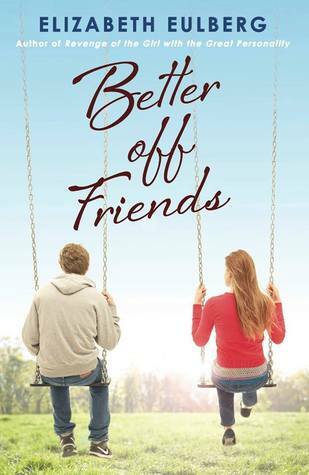 In Better Off Friends, we get to follow the friendship of Macallan, an eighth grade girl dealing with the still-recent death of her mom, and Levi, an eighth grade boy transplanted from California to Wisconsin. When Macallan is given the task of showing Levi around on their first day of school, she mostly just barely tolerates him until they realize they both love the same quirky British TV show. From there, Levi and Macallan become good friends over the course of the school year. When high school hits, everybody thinks they’re dating, but they’re still just friends… best friends. The banter between the two of them, and the way they retreat into their own world throughout various situations in the book, is just nothing short of magical in quality. In addition to the alternating point of view between Levi and Macallan as they go back and tell their story, there are also snippets of their present day conversations in between chapters. Eulberg has written a couple of characters here that I would honestly want to hang out with if they were real; they are full of life and so much fun. The book spans over about four and a half years, which seemed at first like it was moving too quickly, glossing over important things, but by the time I finished I realized the pacing had been perfect – watching Levi and Macallan basically grow up together over those years made the experience even more enjoyable. Another great thing about Eulberg, and particularly Better Off Friends, is that she tells great stories for a range of YA audiences without profanity or glorified drinking/drug use and sexual situations. This book could be enjoyed by 7th and 8th graders looking forward to good, healthy friendships (and romance) in high school, high school students in the thick of it, college/early career readers reflecting on high school relationships, and moms hoping their kids have people like these in their lives as they navigate young adulthood. As you can tell, I really, really loved this new title. So fun, smart, witty, and sweet! Check it out here on Amazon or at your favorite bookseller. 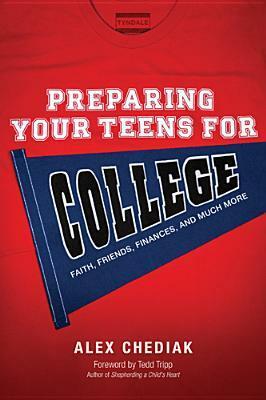 One for the parents… Preparing Your Teens For College! This is a great handbook for parents who are interested in shaping their kids into well-rounded, well-grounded young adults instead of just surviving the teen years and pushing their kids off to college. Which, hopefully, is most parents. I appreciated that Chediak actually started with building the character and faith of teens before anything academic, making this focus of this on building up and truly preparing students throughout high school. Every student will have unique experiences and face different challenges throughout his/her educational career, so the more we can do to give them the tools they need to thrive, the better off they are. If I have one criticism, it’s that it’s long and could feel overwhelming, but the way he has it broken down into separate “conversations” with key points and the end of each makes it more user friendly for parents who might not have time to sit down and do a complete page by page read-through. I read Stolen, also by Lucy Christopher, a few years ago and loved how it unnerved me. When I requested The Killing Woods on NetGalley, I wasn’t even paying attention to the author’s name and making that connection to Stolen, but I sure made that connection quick when I started reading. Christopher has an uncanny ability to make her reader doubt what we assume to be true. It makes for a wild, psychologically thrilling ride. In The Killing Woods, we follow Emily and Damon as they try to get to the bottom of who killed Ashlee, Damon’s girlfriend. Emily’s PTSD military father is arrested for the crime, but did he really do it? No one seems to know or be able to remember, and it’s a pretty crazy ride as we go back and forth between Emily and Damon’s POV until the mystery is solved. I’m recommending this for upper high school and beyond… there’s a ton of drinking/drug use and generally irresponsible behavior, but it’s not portrayed in a positive light at all. In fact, Emily is pretty much the only character who’s actually acting like she has any kind of common sense throughout most of the book. If you can put that stuff aside, though, this is a really well done YA mystery/thriller. It had me on the edge of my seat and a little afraid of the dark while I was reading! 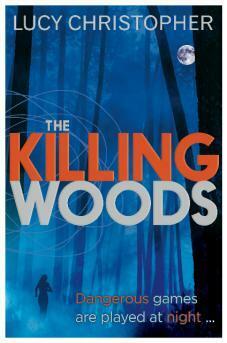 You can find The Killing Woods here on Amazon or at your favorite bookseller. I’ve been a fan of Cassie Mae for a while. She writes fun romantic young adult and new adult titles, which I’ve reviewed here before… Friday Night Alibi, Reasons I Fell for the Fat Funny Friend, and Switched. She’s back again, writing under the pen name of Becca Ann, and this time it’s a joint novel with her writing partner, Tessa Marie. In King Sized Beds and Happy Trails, best friends since forever Ryan and Lexie are going on their senior class trip to a ski resort, and through a series of events (all of which make me shudder as a teacher of teenagers who takes students on overnight trips, because if this happened on one of my trips, OMG), they end up sharing a cabin. Just the two of them and one king sized bed. For Lexie, this is no big deal. She’s sharing a cabin with her best friend, which doesn’t matter much since she’s there to finally catch the eye of one of their classmates who she’s been obsessing over. For Ryan, though, this is a very big deal… his feelings for Lexie went from friend to much-more-than-friend a while back, and watching her pursue another guy is horrible. Thankfully, it’s not long before Lexi realizes the other guy is kind of douchey when she has Ryan so close to her and, well, then things get interesting. I really love Lexie and Ryan in this. Their story in told in an alternating POV between the two of them which was really well done. The overall story was cute, funny, and sweet. I recommend this to upper high school and college – though it’s technically Young Adult, it feels more like New Adult to me. I know I’m definitely looking forward to another Lexi and Ryan story already! Want to join in some fun? Becca Ann and Tessa Marie are hosting a release party today with giveaways on Facebook. It’s a public event, so stop by, join, and enter to win prizes all day long! It seems like, in general, the New Adult genre has slipped into a pattern of beginning with a character deeply affected by some horrible tragedy who finds another character deeply affected by some horrible tragedy and they cling tightly to each other and can’t survive life without the hope of their love. Aside from a few authors keeping it fun, like Cassie Mae for example, New Adult authors are giving off this impression that adulthood has to begin with depression or something. It’s annoying. 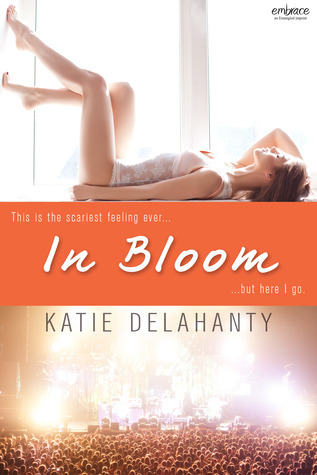 In Bloom is a breath of fresh air for the New Adult genre. Delahanty has written characters that are realistically flawed, but who do not let the circumstances of life become these huge depressing things that dictate whether or not they survive. If you’re looking for depressing New Adult, this is not it. In Bloom felt to me like a slightly older version of Jen E. Smith’s This Is What Happy Looks Like: charming, romantic, fun, and smartly-written. 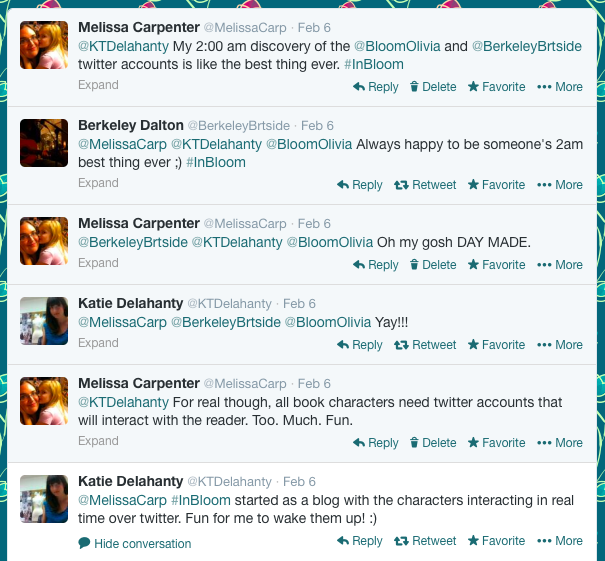 Delahanty has been shaping these characters for years through her blog, and you can totally tell. They feel like real people. I loved Olivia as a protagonist. She handles the pressures of moving to LA to pursue her dreams wonderfully, making great friends and ignoring her crazy mom along the way. She gets a fun job and breaks into the Hollywood scene, meeting the front man of her favorite band, Berkeley. She is accident prone and witty and smart, and several times throughout her story I laughed out loud at her antics. Then there’s Berkeley. He’s sweet and romantic and down-to-earth despite the fact that he’s a world famous rock star, and his pursuit of Olivia is the cutest thing. I developed a total crush on him as I read, and I can only hope he shows up again and again and again in future Delahanty books. Until there are more books in this series, though, there’s always twitter… The characters in the book tweet at each other at the start of each chapter, but it never occurred to me that there would be actual twitter accounts I could follow. But then I found them, and it was magical. I mean, you usually finish a book and have to say goodbye to the characters, right? Not this time, though… find them on twitter, follow them, and let them interact with you. I hope it makes your day and much as it made mine. One more thing I loved about this – Delahanty didn’t feel the need to make it sound like a “grown up book” by having her characters cuss all the time. I appreciated that. Like I said, In Bloom is a breath of fresh air. That being said, I wasn’t a fan of the graphic nature of the love scenes. It surprised me because the language was so clean, and I was thinking I could really recommend this to teenagers and students getting out there and making life decisions, but I can’t do that now. Plus, I think the love scenes would have flowed better with the overall tone of the rest of the book if they’d been more modestly written. In Bloom releases today! Click here to find it on Amazon. 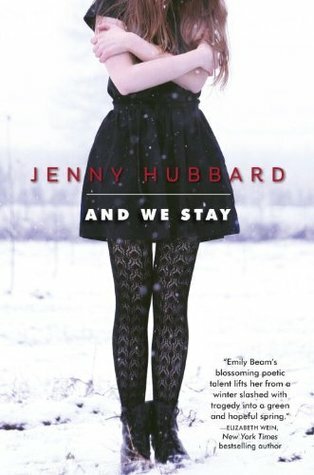 I was intrigued by the synopsis for And We Stay immediately – it had a mysterious, almost ghosty feel to it, plus I liked the idea of incorporating Emily Dickinson along with a character named Emily who writes poetry. It’s like an English major and YA fanatic’s dream come true. There were several things I liked about this story. One, Emily Beam is an interesting protagonist. In the beginning I almost had a feeling like I couldn’t trust her, but then I figured out she was just as confused as I was. She was clearly trying to get over something tragic, and watching her work through it using her poetry and her blooming friendship with K.T. was fascinating. That leads me to the poetry. Emily’s poetry really was Dickins-esque. I loved every word related to the two Emilys and the way their poetry was woven into the story. Emily Beam’s poetry grows and develops throughout the novel, and since it’s written in third person instead of first person, the poetry gives us valuable insight into Emily Beam’s thought process. Really, really, superbly, well done. There’s a great cast of supporting characters here. From Emily Beam’s old English teacher to her ex-boyfriend’s sister to her French teacher, her roommate, and other students at Amherst School for Girls. They’re all believable. Flawed, not stereotypical, and perfect for this story. At several points throughout the story I wanted to find and strangle Emily’s parents, but beyond that, the characters were great. And what a setting… I mean, you can’t get more fun and sort of creepy than Emily Dickinson’s old stomping grounds. The facts that were woven into this were interesting and added so much to the story. I also respect the way Jenny Hubbard handled some very heavy topics. From a shooting in a high school library to teen pregnancy to abortion, Hubbard never treats the heavy topics like they’re no big deal. And, as a woman who is whole-heartedly pro-life, I actually appreciate the real, raw, brutally honest way that Hubbard treats abortion. I almost stopped reading when it became clear that Emily Beam had an abortion after Paul died, but I kept reading because of how realistically she portrayed the emotional torment that results from an abortion. There were a few things that kept me from giving And We Stay my total and complete backing, most of which has to do with personal preference, honestly. For example, I really have a strong preference for first person narratives. I love getting to hear every thought of the protagonist. It makes me feel connected to them in a way that a third person narrative can’t do for me. Another thing was the quick verb tense shifts. While this led, in part, to the mysterious sort of confusing in a good way feel to the book, Emily’s story would shift from past to present so subtly that you had to really pay attention to make sure you didn’t miss anything important. Most importantly, while I know and understand that Emily Dickinson’s Christianity remains up for debate based on various poems and letters and statements and actions, I wish Hubbard hadn’t hit the religion so hard in this. It didn’t feel like it was left with a very hopeful tone faith-wise, so I wish it hadn’t been there quite so much. Maybe it hit me more significantly because I’m very sensitive to that, especially in YA titles, but I felt like the whole story would have been even better with less emphasis on the faith crisis, both of Emily Beam and Emily Dickinson. All of that being said, I really enjoyed And We Stay. Especially for anyone interested in seeing a literary figure like Emily Dickinson explored as the background for a modern day story, I highly recommend this! Find it here on Amazon or at your local retailer. I know this video clip of Ashton Kutcher’s Teen Choice Award acceptance speech has been making the rounds for a months now, but it’s worth watching again. And again. I love the advice he gives us all, but especially teens!